Twenty-eight Russian athletes have had their requests to compete as neutrals rejected by world athletics' governing body, which has approved three others. The IAAF doping review board accepted the appeals of 400m runner Kseniya Aksyonova, javelin thrower Vera Rebrik and 400m hurdler Vera Rudakova. 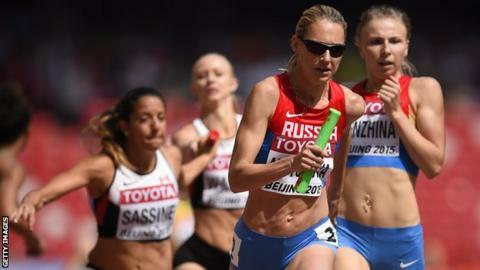 A further 27 cases are under review as Russia's athletics federation remains banned from international competition. Meanwhile, Yelena Isinbayeva has quit her key Russian anti-doping role. The double Olympic pole vault champion, 34, has been critical of the punishment of Russian athletes over evidence of state-sponsored doping in the country. Isinbayeva led the supervisory council at Russia's anti-doping agency (Rusada) but was viewed by the World Anti-Doping Agency (Wada) as a barrier to the country's compliance with their code. Russia has until November to meet those criteria and Isinbayeva says they are on course to do so. "I'm happy that I've achieved my goal. I know that now I need to make way for a new chairman who will complete Rusada's full reinstatement," she was reported as saying by Interfax news agency. Wada president Sir Craig Reedie described Isinbayeva's move as "a major step forward". "Our compliance review committee has a clear view of what the proper structure of a top-class anti-doping organisation should be," he told BBC Sport. "First, the controlling board should have a majority of independent members - Russia has delivered that - and secondly, its chair should be one of the independent members. "That is what they have delivered today. If she stays on the board, then that is their call to make. We are heading in the right direction." Russia was first suspended by the IAAF in November 2015, meaning athletes missed the Rio Olympics last year. The ban was extended in February to cover this year's World Championships in London, which take place between 4-13 August. The IAAF has received more than 130 application from Russian athletes to compete as neutrals, with more than 40 endorsed by their national federation. Any athletes applying to compete as a "neutral" have to meet stringent criteria, including having their clean doping record independently verified. In a statement released on Wednesday, the governing body said they declined 28 cases to date, but did not name the athletes. Aksyonova was 4x400m relay European champion and a silver medallist in the individual event, while Rebrik is also a former European champion. Rudakova has claimed several golds in junior world and European championships. Who else has been cleared? And who hasn't? Yuliya Stepanova, the 800m runner whose evidence helped expose the scandal, was the first to be afforded neutral status - in July 2016 - but subsequently had that revoked as she had previously failed a doping test. Long jumper Darya Klishina was cleared the following week and finished ninth in the final at the Rio Olympics. Then, in February, pole vaulter Anzhelika Sidorova, sprinter Kristina Sivkova and hammer thrower Aleksei Sokirskii had their requests ratified. Last month, high jumpers Maria Kuchina and Daniil Tsyplakov, pole vaulters Illia Mudrov and Olga Mullina, race walkers Sergey Shirobokov and Yana Smerdova, and sprint hurdler Sergey Shubenkov were cleared. Among those still waiting are 2012 Olympic high jump champion Ivan Ukhov, 2014 world indoor triple jump champion Lukman Adams, 2014 world indoor triple jump champion Yekaterina Koneva and London Olympic high jump bronze medalist Svetlana Shkolina.